COŚ wymordowało grupę uderzeniową Templariuszy. COŚ wie, że Cade Williams wyruszy, aby je unieszkodliwić. I COŚ szykuje dla Cade’a i zespół Echo bardzo nieprzyjemne powitanie. “Krzyk aniołów” to drugi tom kronik Templariuszy Josepha Nassise’a, w którym najczystsze zło zostaje przywołane przez grupę niczego niespodziewających się naukowców. Odpowiadam za redakcję językową powieści. Cade Williams was just an ordinary cop until the night he came face to face with a fallen angel known as the Adversary and nearly died. Now he commands the Echo Team, a special ops squad of modern Templar knights, and the things they hunt are far darker and much more deadly than your average criminals. When a Jesuit priest wanders out of the New Mexico desert, telling wild stories about a secret research installation and bloodthirsty demons hunting through its halls, the Echo Team is called in to deal with the situation. Their orders – investigate the facility, determine exactly what happened there, and deal with any infernal presence that might exist. 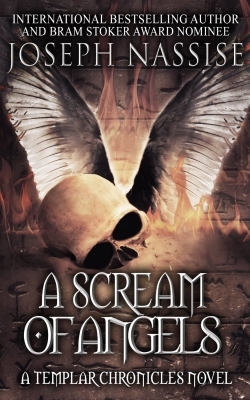 Fans of Supernatural, Constantine, and Grimm will love this hard-hitting dark fantasy adventure that pits modern Templar knights against fallen angels and other supernatural enemies. If you like supernatural thrillers or your contemporary fantasy with a touch of horror, this series is for you!